What is Blackjack Early Payout? Blackjack Early Payout was developed by the people at Visionary iGaming for their Live Blackjack games and you’ll only find it available at casinos using their live casino software. It’s essentially a different version of Blackjack Surrender, where you’re able to cash in your hand before the dealer has completed theirs. Rather than just a flat 50% loss of your initial stake as with surrender, odds are calculated on the probability of your hand wining against the dealers hand. If the dealer holds a strong open card and you’re showing a week hand against that card the return is likely to be less than your initial stake. If your hand is strong and the dealers hand weak, then you’ll get more than your initial stake, but not as much as 1:1 evens if you played the hand through and won naturally. Why would you use Blackjack Early Payout? Sometimes either if the cards are going against you or you have a particularly week hand against the dealers hand it might be worth taking the early payout, so at least you get something from the hand other than a full loss. Is there a strategy for Blackjack with Early payout? Personally, as a regular Blackjack player, I try and stick to basic strategy most of the time. I don’t count cards, instead I use basic strategy unless the laws of probability dictate that I should deviate from it. So for example I might not take a card when I should because maybe the last 5 cards have all been low, so the odds on a high card appearing are higher, so I may pass. Early payout gives you another option at times like that and you may choose to cash in your hand at that point. That of course will be dependent on what is being offered. For a general rule I’d stick to the same formula as Early / Late Surrender. You can see in this example that I’ve been dealt a pair of Aces. I actually ended up splitting the hand and drew 18 and 15. The dealer ended up with a 4 card 21, so I lost. If I had taken the Early payout I would have received 4.95 and my stake back, rather than nothing. Hindsight they say is an exact science! 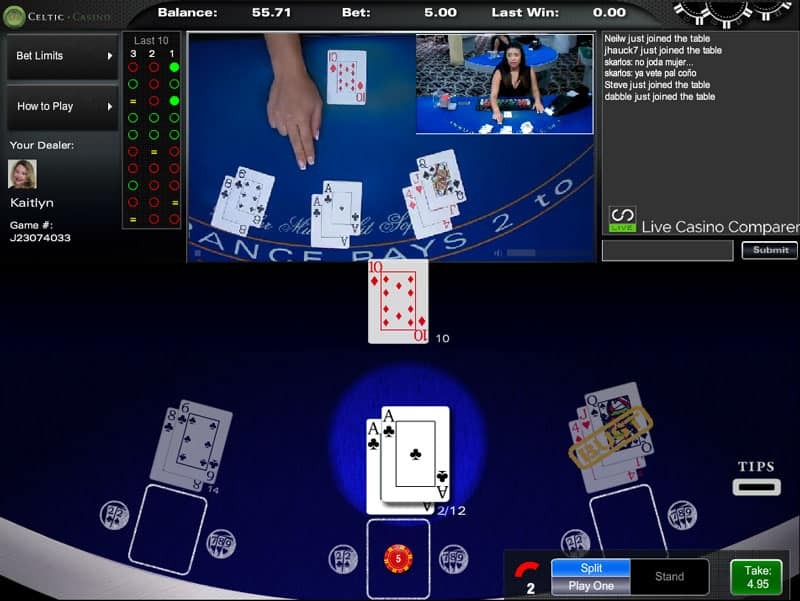 What you’ll notice from the graphic is it’s a 3 handed game, but multiple players can play each of the hands. Each player can make their own choice as to what to do without it affecting the other players. The game has a basic strategy engine running behind it, so in the event that you can’t make a decision basic strategy will be played for you. When it’s your turn you will be promoted what action to take for basic strategy. If you don’t want to accept that then you need to act in the manner you want. European Rules – Dealer takes one card. Early Payout calculated each time your hand changes. Dealer takes a card on soft 17. As I mentioned above Visionary iGaming casinos are the only places where you can play Blackjack Early Payout or Blackjack EP as you’ll see it referred to sometimes. The most popular of the casinos are Celtic Casino, Fairway Casino and Dublinbet. Personally I prefer to play at Celtic Casino.